Here at Rivermead Global Ltd we offer a resale service to clients that bought their properties through us initially, we do get asked many times to sell other properties but this service is purely for Rivermead Global Ltd clients only. Please see below the current resale properties we have available, just click on More Info and send us a request form. Turtles Beach Resort is a beachfront resort being constructed in Al Ahyaa, this 1 bed apartment is located right at the front of the resort with amazing views over the crystal waters of The Red Sea. The apartment is completed and ready for furnishing, the asking price is just £37,000 which is below market value and potential for instalments. Thank you for requesting more information one of our team will be in touch, if you don’t hear from us within 24 hours please check your Junk Mail. This is a 1 bed apartment in Tiba Plaza, which is located in Al Ahyaa close to shops and around a 15 min walk to the sea, just a 20 min drive from Hurghada International Airport and 10km from El Gouna. It is being sold fully furnished and ready to use, the asking price is only £10,500 including the furniture and instalments maybe an option. Thank you for requesting more information, one of our team will be in touch if you don’t hear anything within 24 hours please check your Junk Mail. 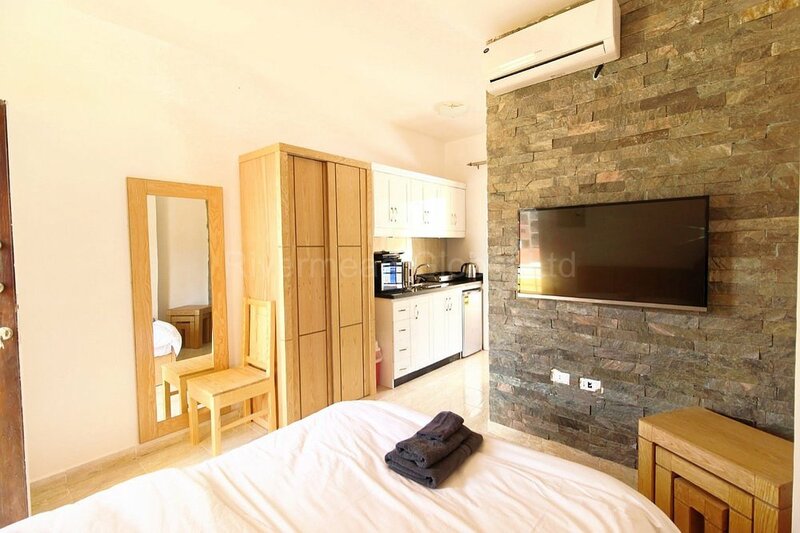 This studio is located within Tiba Royal which is in Al Ahyaa close to shops and only 20 mins from the Hurghada International Airport and 1okm from El Gouna. It is being sold fully furnished and is currently rented out which could be continued or we would give the tenant notice to vacate. The price is £11,500 including furniture and ready to use or continuing to rent out. Thank you for requesting more information, one of our team will be in touch if you don’t hear from us within 24 hours please check your Junk Mail. UNDER OFFER This studio is located within Tiba Star which is in Al Ahyaa close to shops and only 20 mins from the Hurghada International Airport and 10km from El Gouna. It is being sold fully furnished with an amazing kitchen and sofa bed, it's a small studio and is ideal as a bolt hole with view of the pool from the balcony. The price is £8,000 including furniture ready to use. This fully furnished ground floor pool view studio is located within Tiba Resort which is close to Al Ahyaa and El Gouna, only 20 mins from Hurghada International Airport and 6 mins drive from El Gouna. Thank you for your enquiry if you don’t receive a reply within 24 hours please check your Junk Mail. Your details will be added to our mailing list however you are free to unsubscribe at any time and we don’t pass your details to 3rd parties. This fully furnished 3rd floor pool view studio is located within Tiba Resort which is close to Al Ahyaa and El Gouna, only 20 mins from Hurghada International Airport and 6 mins drive from El Gouna. It is being sold fully furnished and has a good rental history as the owner bought and furnished it to rent out and now wants to sell to fund other properties in Hurghada It is pool facing and there are no new pool facing studios left, the price is just £14,270 including furniture and is ready to use/rent out. 12 month payment plan available. This fully furnished 2 bed apartment is located within Tiba Paradise which is in Al Ahyaa and close to shops, only 20 mins from Hurghada International Airport and 10 mins drive from El Gouna. It is being sold fully furnished with solid mango furniture and has a good rental history as the owner bought it furnished with a tenant in (the apartment is still rented out) but now wants to sell to fund another project. It is outward facing and the price is just £22,500 including furniture and is ready to use or continue with the rental. We have a fully furnished beachfront studio apartment for sale, it has never been used and the owner is too ill to go and use it so we have been instructed to sell it. It is being sold fully furnished and ready to use, it is ground floor and pool facing so excellent location, we expect this will be a good property to use as a holiday home but also to rent out when not in use. It is for sale at £32,000 including furniture. These are currently selling unfurnished for £29,000 so a great price. Thank you for your enquiry, we will be in touch within 24 hours if you do not receive a reply please check your Junk Mail. Your details will be added to our mailing list however, you are free to unsubscribe at any time and we don’t pass your details to 3rd parties. We have an unfurnished beachfront 2 bed apartment for sale, the owner is too ill to go and use it so we have been instructed to sell it. The resort is up and running with beach cafe, 360 degree restaurant and is located right on the beach in Al Ahyaa. It is being sold unfurnished but it is ready to furnish, it is first floor and pool/sea facing so excellent location, we expect this will be a good property to use as a holiday home but also to rent out when not in use. It is for sale at £57,000 or offers close to this price. Thank you for your enquiry we will be in touch within 24 hours if you don’t receive a reply please check your Junk Mail. You will be added to our mailing list however, you are free to unsubscribe at any time and we don’t pass your details to 3rd parties. We have an unfurnished beachfront studio apartment for sale. The resort is up and running with beach cafe/restaurant and is located right on the beach in Al Ahyaa. Building work is still going on in phase 2. Thank you for your enquiry, we will reply within 24 hours if you don’t have a reply within this time please check your Junk Mail. You will be added to our mailing list however, you are free to unsubscribe at any time and we don’t pass your details to 3rd parties. NOW SOLD We have a fully furnished 26m2 (Gross) first floor outward facing studio in Tiba Star, Al Ahyaa for sale only used once, the owner has now bought a larger one on Tiba View so no longer needs it. Thank you for your enquiry we will respond within 24 hours. If you don’t receive a reply please check your Junk Mail, your details will be added to our mailing list however you can unsubscribe at any time and we don’t pass your details to 3rd parties. NOW SOLD We have a large 135m2 (Gross) fully furnished 3 bed apartment on Tiba Royal in Al Ayhaa for sale, it has recently had a full refit with brand new modern furniture in every room, including large built in wardrobes and new air con units and electrical appliances. Thank you for your enquiry we will respond within 24 hours if you don’t receive a reply please check your Junk Mail. We will add your details to our mailing list however you are able to unsubscribe at any time and we don’t pass your details to 3rd parties. NOW SOLD We have a large 99m2 (Gross) fully furnished 2 bed apartment on Tiba Resort in Al Ayhaa for sale, it was originally 3 studios but we had them joined together for our client to create a spacious 2 bed apartment with both bedrooms having an ensuite bathroom. Thank you for your enquiry we will reply within 24 hours if you don’t receive a reply please check your Junk Mail. You will be addedto our mailing list however you can unsubscribe at any time and we don’t passyour details to third parties. This fully furnished pool view studio is located within Tiba Resort which is close to Al Ahyaa and El Gouna, only 20 mins from Hurghada International Airport and 6 mins drive from El Gouna. It is being sold fully furnished, there are no new pool facing studios left, the price is just £14,500 including furniture and is ready to use/rent out. Thank you for your enquiry, we will respond within 24 hours if you don’t receive a reply please check your Junk Mail. You will be added to our mailing list however you are free to unsubscribe at any time and we don’t pass your details to third parties.